Every June Kingston School Of Dance puts on an annual performance. At least one of my daughters has been in this show since 2012. 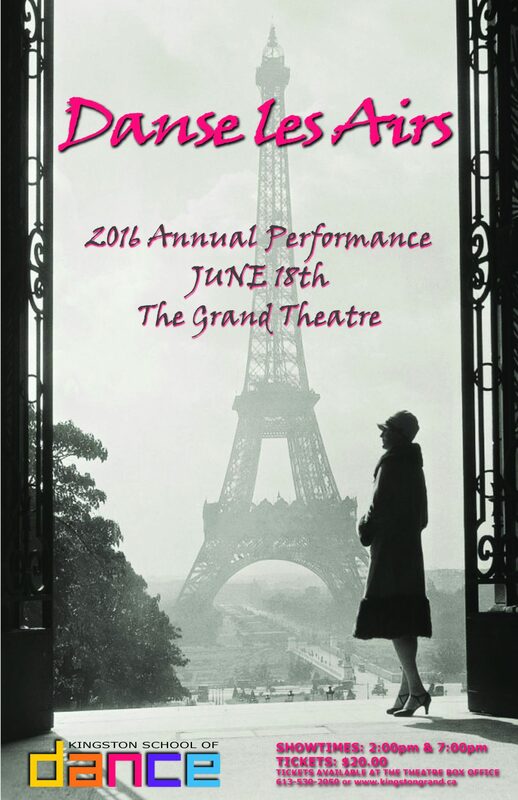 On June 18th Kingston School Of Dance is having their Annual Performance at the Grand Theatre. Tickets are already on sale – I hear the afternoon performance is already half sold! Danse Les Airs is going to be a two act show, with a full ballet in Act 1 and then all the other dance styles in Act 2. The show has been great fun (and showcased amazing skill) in years past. This will be Emma‘s 4th time dancing on the “big stage” and she loves every minute of it. Rose will have her “big stage” debut this year and she is very excited. I’m not convinced she really understands what it’s all about yet, but I hope she doesn’t get stage fright once she sees what the “big stage” really is! While I have been taking dance for 6+ months now at KSD I will not be in the Annual Performance. I love my ballet class, but it’s a drop-in style that’s laid out more as an exercise/technique class and we don’t all come every week so we don’t get a spot in the show. I’m totally fine with that because if I were in the show I wouldn’t be able to watch my kiddos do their thing! There are two shows this year, as there have been in the past. The first show is at 2pm and the second at 7pm. We are attending the 2pm show and Patrick is doing the backstage volunteer thing at the 7pm show. He’s on the board of directors for Kingston School of Dance so I think he was volun-told to help out. All the dancers are in both shows, which means I get to fix hair (which my kids love so much!) twice that day. Long story short – go see this show! The dancing is always amazing and everyone works so hard to put this together that it’s well worth the $20 (+ fees) ticket. You can click here to go directly to the ticket purchasing page. Please comment below if you’re going (or even thinking about going.) I’ll look for you at the 2pm show, or I’ll ask you what you thought if you’re going to the 7pm show. It’s always a great time, and I love supporting local talent! I was not compensated in any way for creating this post. We enjoy Kingston School of Dance and are happy to promote their events. Visit my Work With Me page for information on working with A Modern Mom’s Life.